Through a collection of essays, this book examines how public historians approach the institution of slavery as part of American history. It is an uncomfortable and difficult part of the nation's past that stands out in sharp contrast with the founding principles of the United States (vii). It is a part of American history that many people would rather forget, but that is not an option, for slavery left a stain on the nation's fabric. It cannot be removed, nor should it be. 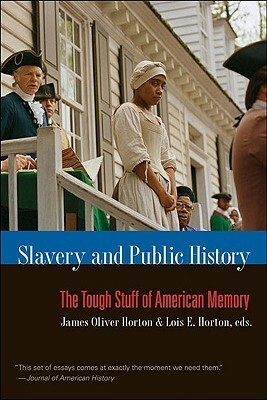 Public historians should think carefully, therefore, when engaging audiences with this subject.James Oliver Horton, one of the volume's editors, points out one of the principle problems historians run into when engaging with the public on the subject of slavery: "...the vast majority of Americans react strongly to the topic, but few know much about it" (pg. 37). It is the duty of historians to dispel myths associated with slavery, and educate the public on its history. However, it means that public historians must be willing to engage in an honest dialogue about slavery, even though it is an uncomfortable part of the American historical memory. Horton identifies this as "...the public historians most difficult assignment" (pg. 55). One method historical sites employ to interpret slavery's place in American history is the use of living vignettes. Colonial Williamsburg used African Americans to portray slaves at their site with mixed results from visitors and actors alike; some of whom experienced powerful emotions while standing on the block during a mock sale at the slave market (pg. 52). However, when a historical site decides to use a living history model, those involved must be cautious of how they interpret slavery. One of the chief concerns is remaining conscious that the performances do not drift from educational presentation into spectacles of pure entertainment (pg. 51).Slavery and race are tough issues for Americans to deal with in their history. Slavery is part of the collective memory of a nation that claims a foundation on liberty and equality. Public historians cannot shy away from the topic of slavery; they would be irresponsible as professionals, and would create an injustice to the memory of all who were affected by slavery. In this book, David Blight writes "people will develop a sense of the past by one means or another..." and historians should help guide the interpretation of slavery's role in the history of the United States (pg. 25). No matter how harsh the truth may be, as the title of Blight's essay suggests, "if you don't tell it like it was, it can never be as it ought to be" (pg. 19). I had to read this book for my Public History class and I actually thought it was an interesting book. It was made up of many different essays relating to slavery and how should it be presented in Public History. What is too much little information or way too much information that it could be insulting to people. I got a used copy for class and it was interesting to read the chapter about Thomas Jefferson and seeing highlighting sentences and underline sentences in pen and this person opinion and this essay. I am glad my professor had us read this book. This book is a collection of essays by public historians on how museums, historic sites, memorials and other landmarks are dealing with the issue of slavery. For many years, if you went on a tour of Thomas Jefferson's Monticello or George Washington's Mount Vernon, you might never hear the word "slave." Euphemisms like "servant" would most often be used. For the most part, that has changed. Most sites and museums have embraced the concept of telling it like it really was, but it hasn't been easy, and there are still some holdouts. But for the general public to get a full picture of American history, slavery can't be minimized. Some of these essays show how much of a struggle it was to be allowed to tell the story, some show a struggle still ongoing. Still, there are many success stories in this book. This is a fantastic book but reads not quite as fun as other history books I’ve read, such those by Sarah Vowell. The themes and issues covered are thorough yet broad and all the contributors and editors did an excellent job describing the challenges, opportunities and imperatives of accurately engaging with America’s past (slavery, in particular). This book had a very polarizing effect on me. I either wholly agreed or disagreed with the opinions it expressed; there was no middle ground. The book is meant to be a platform for how to discuss slavery in public history institutions, but the essays within incite strong feelings, and not always in the best way. I will admit I read this for a class, and unless it had been assigned I probably would not have picked it up. Some of the essays had excellent points to contribute to the discussion of slavery and public history like, "If You Don't Tell It Like It Was, It Can Never Be as It Ought to Be." Balancing public memory with recorded history can be tough. Other essays were nothing more than an outlet to express frustration over something that should have never been an issue in the first place like, "For Whom Will the Liberty Bell Toll? From Controversy to Cooperation." Not only was this essay the least contributing to the overall book, it was the most boring. If you are interested in this topic, then by all means pick it up. A word of caution though: this book is not meant to be a light read for an afternoon, but rather to be taken chapter by chapter to be thought about and discussed. If you are wanting something fun and imaginative, I would try something else. Really enjoyed reading the book...some of the topic matter was difficult and thought-provoking. Sometimes I think about how far we as Americans have come...and yet, we still have so much prejudice, bigotry, and insensitivity to others and their feelings. Slavery is a hard topic. Many people believe that slavery no longer exists. I hope someday the world will no longer tolerate the horrid treatment of others. For us in the United States...we need to take our blinders off and realize there are people who are still mistreated...and we need to do something about it. Extremely in-depth look at the ongoing debate about slavery and the Civil War. This books consists of eleven essays by academic and public historians. Of particular note were the essays by David Blight ("If You Don't Like It Like IT Was"), Bruce Levine ("A Usable Past") and Dwight T. Pitcaithley ("A Cosmic Threat"). It follows the effect on our public memory in the south, but also in a place like Rhode Island, treating the myriad of "memories" that we have, from White Southern, Neo-Confederate, White Northern, and African-American. This one had excellent essays about how slavery has been treated in public history. I agreed with many of their points especially the overarching theme that having a better education system will provide for a more open dialogue of these issues, including racism. I recommend it to those interested. Bonus is that you don't have to read it all in one sitting, it can be done over time since it is a collection of essays! I really enjoyed this book. It is actually a collection of essays from different perspectives in or pertaining to the field of Public History. While I did not necessarily agree with all of the opinions expressed in each essay, I still felt as though I learned through these people's experiences. I also appreciate the book's theme as a whole, which expressed concern for the state of public education and how it teaches students about slavery. it's actually by both her and her husband. anyway, great collection of articles on remembering slavery and present outlook on race. her own article could have included what tour guides were saying to guests for her evidence on their reactions of jefferson to be more conclusive. but, i won't get into each article...if you want a decent book about how remembering slavery has transformed since it's ended, this book is the way to go. If there was any question to begin with regarding why we study slavery, this book provides the answers. Not only must we consider how we remember such dark chapters of American history but why we remember them as such. This work also raises the question of who the true revisionists are. Some essays in this collection were excellent some less so hence 3 stars. This was an excellent idea for a book. Public history is a fascinating thing and the resources used by the scholars here reveal so much about the friction points between the past & the present. Potent. Historians, public or no, go read this. Now. Meh. There are a few strong articles--specifically the David Blight piece--but as as whole, it isn't as great as I had hoped it would be. Mostly I felt guilty for making my students buy it. Read for my intro to museum studies course--so glad I was able to read this classic! Read for class. Eye-opening about representation of slavery in American historical sites and museums. For my purposes, this book was too surface; series of essays, rather than historical facts.